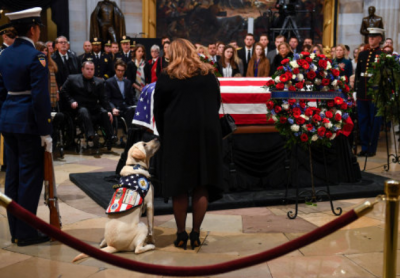 This week, dozens of people gathered at the Capitol rotunda, in Washington DC, in order to pay their greatest respects to the late, former President, George HW Bush. 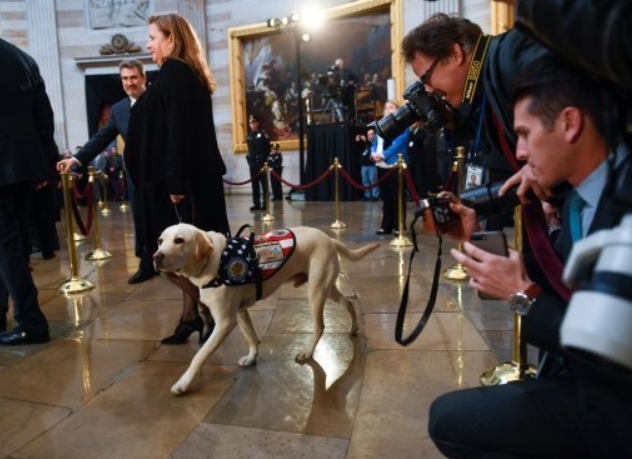 Although, it wasn’t actually just people who attendend, they were joined by a very special four-legged guest; Sully the service dog, the former US President’s prominent friend. 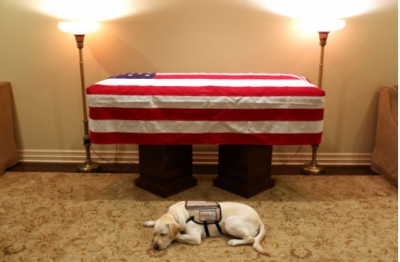 Maybe you recall a few days ago when a photograph emerged online which showed the truly heart breaking scene of Sully laying by his former master’s casket after Bush passed on Saturday 1st December? 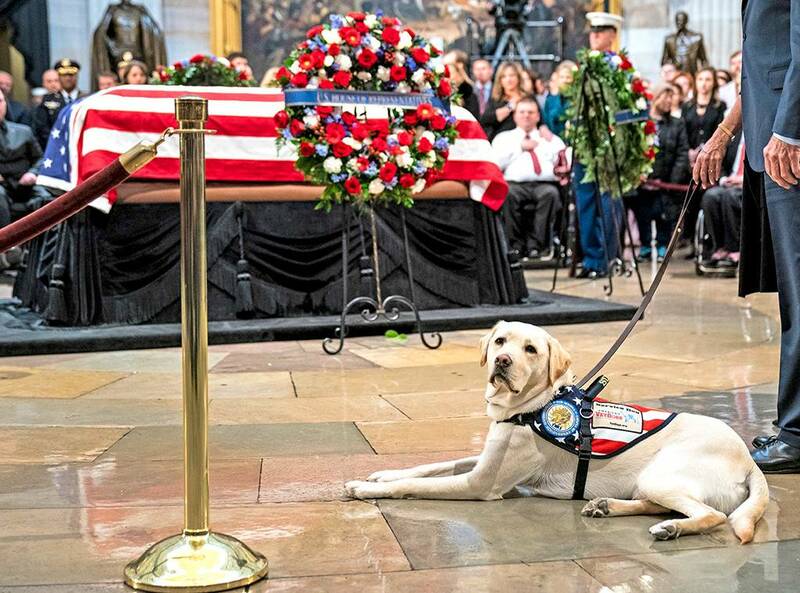 Well, people have now been left in giant puddles of emotions once again after Sully showed up to pay his final respects – dressed in his finest therapy dog vest, which was very aptly adorned with the Stars and Stripes. As you can imagine, along with Sully, there are people all across the US who are currently mourning the 41st US President. Bush served just one term from 1989 until 1993 and pretty much oversaw the country through the fall of the Soviet Union and the Gulf War. 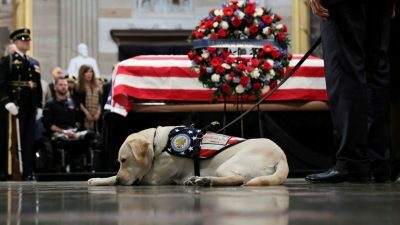 His body is currenty “resting” in teh US Capitol before it’s then moved to the Washington National Catherdral (which will happen today) for a memorial service. 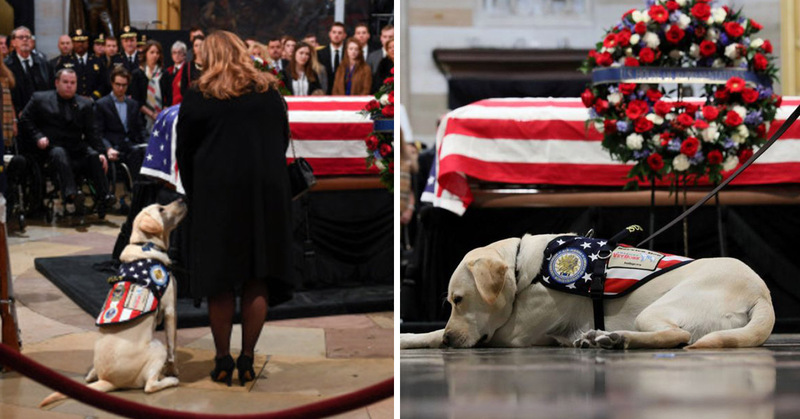 This past Monday, his son George W. Bush – who also became President (the 43rd, to be exact) back in 2001 – was the one who shared the heart wrenching photograph on Instagram of Sully lying lovingly next to the casket of his late friend. Despite the pair only being together for a short time (Sully was given to Bush shortly after the passing of his wife, Barbara back in June of this year) it’s completley evident from the dog’s own emotive state in the photo that they really had devloped a strong bond over those six months together. The current President of the United States, Donald Trump, and the First Lady, Melania Trump, were also among those who paid their respects to the 41st President as they visited the casket at the rotunda. Sully was also joined by several army veterans, some of whom were in wheelchairs from injuries during their time at war due to the fact that he is actually trained to assist US army vets as part of thr VetDogs programme. Neil Bush – one of the late president’s sons, was also present. As a specially-trained service dog, Sully (was named in honour of the heroic pilot Captain Chesley ‘Sully’ Sullenberger III) was brought in to assist Bush, who was sadly suffering from Parkinson’s in his later years. He did this by opening doors and being able to get help, should the former president have ever needed it. 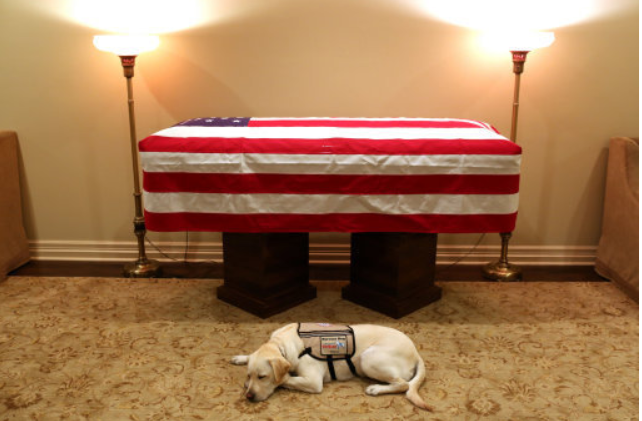 No matter the length of time they spent together, Bush was clearly very special to this little pooch and if the photos show us anything at ll it’s that Sully was very dedicated to his master and more than that… he was a very, very good boy.